So today, I am here to sing the praises of Onda; my voice representing only one in a growing choir that rhapsodize about this extraordinary release. 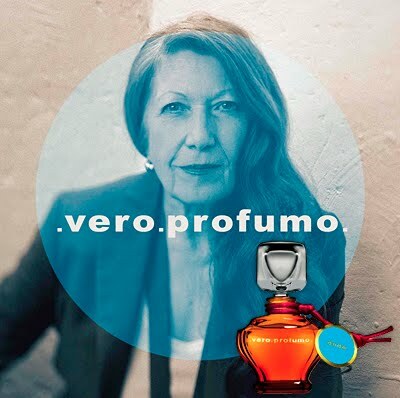 Swiss perfumer Vero Kern stands firmly at the helm of her company Vero Profumo; a brand whose olfactory proclivity aligns itself with the classic perfume houses of the early 20th century, and one which is rapidly gaining ground in the luxury perfume market. Choosing not to do anything by halves, Vero stepped onto the world stage in 2007, surprisingly with three extraits in hand; Kiki, Rubj and Onda. Kern's trio of pure parfums are something to be treasured. If not for the stunning flacons and exceptional quality of the raw materials used, then for Vero's sensitivity to the art of blending and consummate craftsmanship. Whilst all three scents deserve lustrous accolades, Onda in particular, serves as a thought-provoking reminder as to what the perfuming arts are really all about. Just one afternoon spent with this incredible extrait is all it took to force me to reconceive what is really important about perfume... to look beyond the physical: (bottles, labels, packaging and oils suspended in alcohol)... and to give in to the invisible and the implied. Onda is timeless in a hauntingly beautiful way: it speaks of antiquated eras filled with lush Art Deco architecture, art, clothing and style. It puts its olfactory bookmark right between the pages of history where the Jazz Age was in full swing; a time of glamour and defiance where "Flappers" wore brief skirts and bobbed hair, and where black & white silent movies finally found their voices. It was a dynamic period following the horrors of WWI, marking a break with tradition and renewed social and artistic expression. Onda is a spectacular leather perfume that is composed of warm honey-like amber accords, sharp ginger and dry vetiver - a mixture that inspires rememberance and nostalgia. Whilst it offers a deeply moving sense of familiarity, it also reveals a hollow pang of sadness and despair... much in keeping with the style of Guerlain's Vol de Nuit and L'Heure Bleue - two perfume triumphs of that age. Tender iris lends a soft dryness which works in unison with the vetiver and leather base to furnish Onda with a vintage "airless" closed-over-the-ages feel. 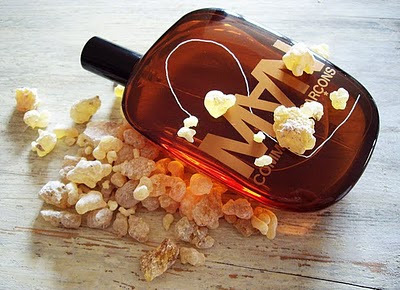 The chypre-style amber/patchouli base is warm and enduring... sitting on my skin for close to 24 hours. As the final whispers of Onda dissipate from my arm, so too do the images of the 'flappers' and the 'sheiks' in my mind's eye. Their smiling sepia faces fade like ghosts from a vintage photograph, leaving only the depiction of a grand Art Deco music hall behind. Sometimes words simply can't articulate that which the human nose and mind knows. Onda is a perfume whose masterful execution and fathomless beauty sets a benchmark that other perfumers should aspire to achieve. 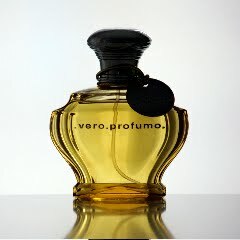 Onda, Kiki and Rubj are all available as extraits via retailers listed on veroprofumo.com, and are something to be truly experienced. Campomarzio70 in Rome, Italy are exclusive worldwide distributors of Vero Profumo and besides stocking the extraits, also exclusively carry 50ml eau de parfums of the trio, as introduced at this years Esxence expo in Milan. It is worth noting that the EDP's are not simply diluted versions of the extraits - Vero Kern has made a conscious effort to highlight the EDP's topnotes, without compromising the unique and timeless charm of the extrait. Having sampled both the extrait and the eau de parfum, I can attest first hand to her success. 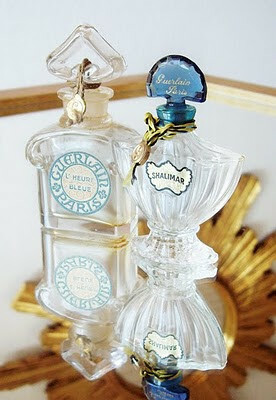 Resinous fragrances appeal to me in a manner like no other. Perhaps my inherent appreciation for frankincense and other tree stones has emerged from a childhood immersed in orthodoxy; where the perfume of frankincense was enjoyed at numerous ecclesiastical celebrations throughout the year. There is nothing I like more than to burn the stones over coal discs and enjoy the aroma, or to source scents in which resinous accords are executed masterfully. Comme des Garcons 2 Man has been on the market for 5 or 6 years, but in my book, still remains a top contender for my "Best Frankincense" accolade. Whilst it reveals a sharp orange metallic accord when first applied, 2 Man swiftly evolves into a deliciously warm frankincense / incense scent, which surprisingly remains somewhat transparent throughout the course of its life. Often, I find incense fragrances have a husky or dry quality, but this eau de toilette remains crisp and unclouded; boasting a sense of stark purity that is very much in keeping with other Comme des Garcons releases. Whilst many have been hasty to compare this to Gucci Pour Homme, I find the likeness rather superficial. Whilst both scents engage the nose with lovely resinous hearts, Gucci hones in more on pepper and woods, whilst Comme des Garcons explores sheer white smoke and spices. Much in the same way Andy Tauer's L'Air du Desért Marocain manages to masterfully evoke sensations from the shifting desert sands, so too does 2 Man. Cumin and nutmeg suggest an interesting marriage between bitter and sweet accords, however the shining star of all spices used here is awarded to a slightly acerbic (almost plasticky) saffron. Saffron in itself is a difficult scent to describe, however 2 Man rather successfully interprets the aroma of these blazing red stamens. (Washington Tremlett's Black Tie is the only other perfume I have encountered in which the saffron notes used possibly best resemble the actual foodstuff). The sum of these individual components make for one of the more beautiful incense fragrances on the modern market. 2 Man lingers on my skin for a very generous 8-9 hours, and whilst marketed to men, has an equally strong female following. Comme des Garcons 2 Man is available at www.essenza-nobile.de in 100ml flacons for €69. Random acts of kindness: a salute to Jacqueline Johnson. There is something pure and honest about perfume. Not only does it possess the capacity to transform the wearer, but it manages to succeed in bringing together all those that love and adore it. 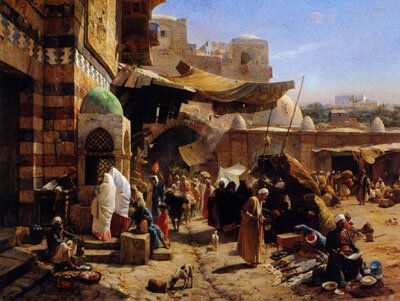 I don't need to tell you that entire communities exist in praise of the perfuming arts; each one representing a cross-section of bottle collectors and perfume historians to spray-card collectors and amateur noses. Whatever one's individual predilection, a sense of citizenry exists between scent-lovers the world over. It is a fellowship that reaches beyond borders, from one home directly into another. It is a bond that is achieved without words... but rather, a keen sense of smell. Robert Johnson of Becker Street Antiques in Portland, Oregon very generously sent me the charming bottles pictured above. Why? Simply because he knew I'd treasure them. 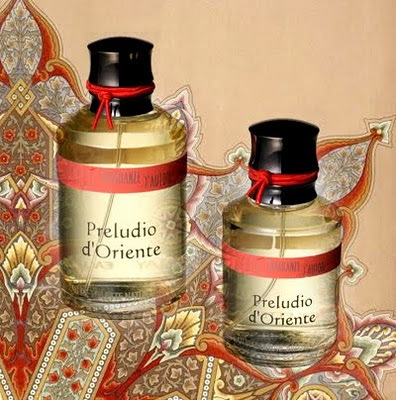 A connection that materialised practically out of nowhere, and one that is proof positive that a feeling of camaraderie is alive and well in perfume circles. Whilst I've never met Rob in person, I feel we share the common understanding that perfume and their individual presentations are something to be enjoyed and appreciated. That's precisely what Robert's wife Jacqueline might have believed too, before her passing not so long ago. 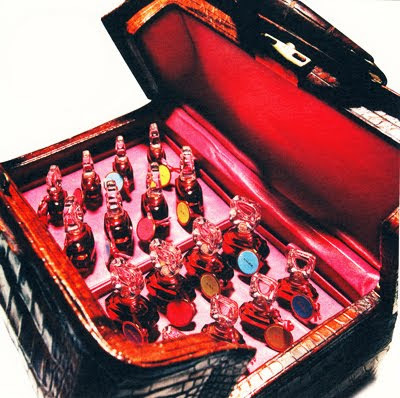 Jacqueline Johnson was a passionate perfumista and member of the IPBA (International Perfume Bottle Association) where she penned regular columns for their quarterly magazine, and offered valuable advice to collectors on ebay. Jacqueline also presided over the impressive online vintage perfume inventory on the Becker Street Antiques website. 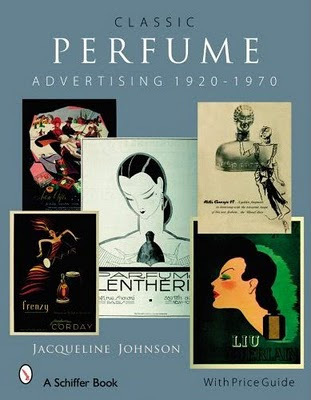 Perhaps her most dedicated efforts though, culminated with the publication of her very own 190-page book titled Classic Perfume Advertising 1920 - 1970, a book that was sadly launched at the same time as her passing. I see much effort and care has gone into compiling this beautifully illustrated compendium of advertising material, and urge anyone interested in purchasing direct from the publisher to visit www.schifferbooks.com in the US, or www.bushwoodbooks.co.uk in Europe. I am always amazed at how perfume touches so many lives in so many ways. I will always cherish this Baccarat L'Heure Bleue bottle and lovely Shalimar flacon, not just because they are Jacqueline's anonymous gift to me by way of her husband; but also for her lasting contribution to the preservation and appreciation of the art.